Note: I started writing this post before the Senate Tax Deform bill passed. Life has not been hospitable to my blogging lately. Lots going on. We are currently inundated with the bizarre kabuki blather that is the GOP claims-making machine as they try to convince their base that they are offering much needed “tax reform.” Their argument, every year, goes something like this: With years of Obamasocialism and sky-high taxes that are crippling the economy, it’s now time to give investors the incentive to create jobs and unleash the Invisible Hand from the socialist cuffs that bind it. Thus everyone will prosper. All the world will sing praises to Milton Friedman and everyone will have a pony and a stable of flying pigs. That’s what the wonders of the market will do if we only reform the tax code to give some much-needed tax relief to the beleaguered billionaires who are having such a hard time making ends meet. Problem is that none of the statements above is true in any reasonable sense. That includes the use of the phrase “tax reform.” The GOP tax plan is nothing much more than a printout of the corporate conservative wish-list. Even conservative economists are baffled. Conservatives are so intent on handing their corporate leash holders an early Christmas that they’ve crammed everything they could under the tree. Regardless of how regressive, cruel and cynical this tax bill is, however, what they are offering is hardly reform. The underlying structure of the progressive income tax remains intact, just less progressive. The standard loopholes for the wealthy are wider. The favoritism to corporate people over people people is more glaring. If anything, the GOP is advocating tax “deform.” Which is, of course, what they advocate every year. The only thing surprising about their package is the sheer audacity of it. Perhaps they feel Trumpism will bring the Republican Party the way of the Dodo. Maybe this budget is more of a bucket-list than a wishlist. So I’d like to help the GOP out a bit by simply building upon a foundational bit of conservative rhetoric, stuff the right says, but never really means. Namely, I’d like to offer that I agree with the conservative claim that it is immoral for the government to take someone’s hard earned money away from them. In fact, I’m not sure why this isn’t the standard argument of the left. After all, in a capitalist system, those who work for their income are already being exploited. The Labor Theory of Value demonstrates that profit is the surplus value that is derived by paying workers less than the value of their labor. All workers are exploited in the market, it’s just a matter of by how much. and it is true that the American tax system is pretty progressive, but it’s hardly just as is evident from any analysis of inequality in this increasingly plutocratic country. For one thing, our progressive tax system does not take into account the nature of the work that is being done and the level of exploitation experienced within the social strata. The maintenance man at Goldman Sachs goes home aching every night, while a broker at Goldman may put in some long hours, but is almost certainly not experiencing the same pain in her joints, but I’m sure she has ulcers and other problems. She also has a health package that the maintenance man does not have. In the meantime, the person the maintenance man is maintaining and for whom the broker is making money almost certainly spent the day at Mar a Lago, sipping umbrella drinks, undertipping the wait staff who brought him his filet mignon and groping whoever catches his fancy (because, you know, they let you). Clearly not an even distribution of labor. 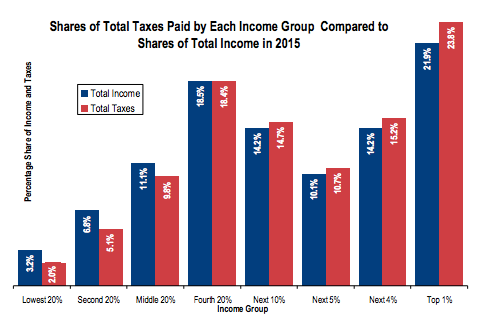 A truly progressive tax plan does not evenly distribute the tax burden. A truly progressive tax places the heaviest burden on those who derive the most benefit from society, who suffer the fewest pains from supporting the system while, at the same time, alleviating the burdens of those most afflicted. It should go without saying that the Republican plan does exactly the opposite. As it stands, those who make their income by investing in other people’s work, who own pieces of businesses that they do not, themselves, manage, will receive the largest windfall. Those who actually do the work will pay the costs. They will either pay higher taxes or shoulder the costs by receiving fewer benefits. Either way, the largesse of those at the top will be funded by those who physically create the wealth. And this is a constant, regardless of how progressive our income tax is. So let’s just do away with the income tax altogether and come up with something new. In 1879, in his book Progress and Poverty, Henry George pointed out that all taxes, in some way, de-incentivizes economic activity. His solution was to institute a one hundred percent tax on the unused value of land. In other words, the land, in its natural state, without any form of development, should be taxed at its value. Any value derived by developing the land, either through agriculture, industry, housing, or any other form of market endeavor, should go untaxed. This would incentivize economic production and be a check against the super-wealthy buying up land to hold as an investment. In essence, the value of land would be reduced to zero. This is an interesting idea, but we now know that there is a benefit to leaving land undeveloped and a significant cost to over-development. The premise of George’s idea, however, is sound. Create a tax system that encourages economic activity, but places the burden on those who could most afford it. That’s why I suggest that income, that is earned income, should not be taxed. When I go to work and get my paycheck, I should be able to keep my money. That money is the negotiated remuneration that I receive for utilizing my skills. Taxing income disproportionately impacts working people and becomes a dodge for those wealthy enough to be able to claim zero income while sitting at a desk in their private jets on their way to some island tax haven. Instead of an income tax, I would like to propose a tax on wealth and surplus value. This would take the tax burden off of the shoulders of working people and place it within the responsibility of those who benefit from the system. And don’t tell me that it is unfair to expect the wealthy (the holders of wealth) to carry all of the burden. First, they’re not and never have been. There are other forms of taxation, like a sales tax, issued by state and local governments that disproportionately impact working and poor families. Everyone pays into the system. Secondly, it’s not unreasonable to ask those who disproportionately benefit to disproportionately pay. No, the wealthy are not serving a public good by virtue of being “job creators.” First, whether or not they create jobs is secondary to their wealth accumulation. If they can accumulate wealth without producing a single job, and many do just that, they will. Also, as mentioned above, they benefit from the jobs they create. If they didn’t profit from the jobs they produced, the surplus value of the labor they hire, they would not create the jobs. Thirdly, we can acknowledge to an extent the claim made by conservatives that taxing the wealthy, especially the businesses, will only be passed on to consumers in the form of higher prices on the goods and services they receive. Well, if they are passing on the burden to consumers, they are not carrying the burden. Of course, the flaw in this argument is that they can only pass on so much of the tax burden to consumers. There’s this thing called supply and demand. If costs rise too high, the demand drops to the point that it is no longer viable to sell at that price. So producers will weight the benefits of passing on the costs based on their economic bottom lines. According to the Global Wealth Report 2017, the total household wealth held by the United States was over $90 trillion. Now, think about that. An equal distribution of such wealth would put almost $390,000 in assets into the hands of every American adult. But that’s not even close to how this wealth is distributed. According to the Congressional Budget Office, in 2013, the top ten percent of families held 76% of all U.S. wealth. Now if that figure held true in 2016, and there’s no reason to believe that it hasn’t, that means the top ten percent of households¹ hold over $70 trillion in wealth assets. Our current federal budget is around $4 trillion. If we tax the wealth assets of just the top 10% alone at only 3% and everyone else at 1, that’s $2.3 trillion right off the bat. Then we can look at surplus value. Let me explain. My wife owns a business. From this business, she draws an income. If she were the only person working in this business, every cent of profit goes untaxed. That’s her income. She earned that money through her own hard work. Now, let’s say she hires someone. The work that employee brings to my wife’s business is worth $80,000 a year. My wife pays the employee, (or contractor, or whatever work arrangement is involved, those scams don’t apply by this metric), $60,000. The $20,000 that my wife pockets from her employee’s work is taxed, let’s say at 10%. She still pockets $18,000 that she did not work for, so she still has an incentive to hire, but the employee does not get exploited for another $6,000 by the tax collector. There are plenty of avenues by which to tax surplus value. Taxing corporation profits, which came in at $1.7 trillion in 2016 would be a great start. A twenty percent tax brings in $340 billion dollars. Rental income came in at over $700 billion dollars. The most lucrative of all, however, is in taxing stock exchanges. According to the World Bank, investors in the United States traded over $42 trillion worth of stocks in 2016. A one percent transaction tax would bring in more than our current federal budget. As it stands, the American progressive tax, at its best, does a good job of evenly distributing the tax burden across the social strata. That’s great. Kudos to us. In the meantime, those sources of income used by the investment class result in increasingly disproportionate accumulation of wealth in the hands of the one percent while working Americans struggle to get by. Our nation runs a deficit every year and faces an ever-increasing national debt while basic social goods are neglected. Our infrastructure is a global laughing stock. The safety net has so many holes a dolphin can swim through it. We pay double for mediocre health care. Yet, because of our so-called “progressive” tax structure, we can’t address any of these issues because we just don’t have the money. Well, we do have the money. It’s just in the wrong places and not being accessed by the public. If we change our mindset from taxing income to taxing wealth and surplus value, it’s clear, that we have more than enough to fund all of our nation’s needs and still construct an obnoxiously over-sized military with which to rule the world–even recognizing that my calculations are overly simplistic. Furthermore, the tax rates that I’ve suggested are not particularly burdensome, except for the tax on corporate profits, none of the proposed rates are higher than 5%. And the corporate rate is at exactly the level the President and many conservatives are advocating. This is a no-brainer. It’s also exactly the opposite of what the one percent wants, which is to shift ALL of the tax burden to working Americans while providing no benefits whatsoever. This is real tax reform that everyone, conservative, liberal, even socialist, can embrace.